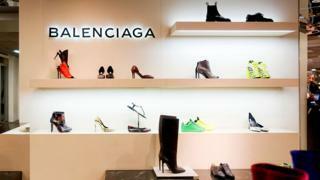 Luxury fashion brand Balenciaga has apologised after claims that Chinese shoppers were mistreated at a Parisian outlet sparked a backlash. Balenciaga and upmarket retailer Printemps apologised on Chinese social media, where news of the incident has attracted over two million comments. A video posted online appeared to show a Chinese customer assaulted at the Balenciaga shop inside Printemps. Its caption read: "Boycott Balenciaga [for] discriminating against Chinese." Balenciaga, known for its luxury shoes and handbags, is part of Kering, which also owns Gucci and Yves Saint Laurent. Citing the video, China's state-run Global Times claimed the incident had begun after the man's mother scolded queue jumpers while she was waiting to enter the Balenciaga outlet. It is common to see long lines of customers from China and other countries outside Parisian boutiques. One of the queue-jumpers then pushed the woman and threatened to punch her, prompting her son to intervene, it was alleged. The son was wrestled to the ground by the group, the Global Times reported, adding that a sales clerk then allegedly insulted the Chinese customers and told them to leave. The hashtag #BoycottBalenciagaDiscriminatesAgainstChinese has been viewed at least 29 million times on Chinese social media platform Weibo, China's equivalent of Twitter. "Balenciaga shoes are beautiful, but such an episode is an eye-opener," said one Weibo user. Another wrote: "You can say goodbye to the Chinese market." Image caption It is common to see long lines of customers from China and other countries outside luxury stores in Paris. In a statement in Mandarin posted on Weibo, Balenciaga said it regretted the incident and noted that security guards had acted quickly to restore calm. "Balenciaga sincerely apologises to the customers who were present and reaffirms its strong commitment to respect equally all its customers," it said. Printemps said that staff would receive additional training to ensure they manage such situations in the best possible way. "We would like to extend our sincerest apologies to the Chinese customers involved in this altercation as well as to all those who were upset or inconvenienced in any way," the department store said. Paris is a favourite European destination of Chinese travellers, who are a crucial market for luxury brands. Just this week, Kering reported a 27% jump in sales, partly as a result of a recovery in spending by wealthy Chinese shoppers. Why do the Chinese love Bicester Village?